From left are Dennis Hershberger, Betsey Vastbinder, Abigial Rahn, Hannah Shapiro, Elena Sullivan, Kaylee Ochoa, Rachel Doyle, Todd Braddock, and Amanda Scroggs. WARSAW — Warsaw Community School Corporation celebrated both student achievement and staff accomplishments during a nearly two-hour-long regular session of the Board of School Trustees Monday night, May 21. In a board meeting chockfull of accolades pouring down on faculty and students alike, the board room was standing room only as those recognized were lauded for achievements at the state and national level, as well as for years of service. Superintendent Dr. David Hoffert congratulates Dr. Shu-Chun Tseng. 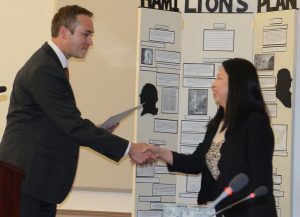 Superintendent Dr. David Hoffert acknowledged the corporation’s Dr. Tseng for her accomplishments in language arts. “She was selected as the teacher of the year at the secondary level of Chinese language by the Chinese Language Teacher’s Association of Indiana,” said Hoffert. Warsaw’s Director of Transportation Mark Fick called up five bus drivers who were awarded for their years of service. The drivers were Colleen Fritcher, 25 years; Bernie Waikel, 26 years; Sally Johnson, 28 years; Jackie Clase, 30 years; and Lisa Wallen, 31 years. 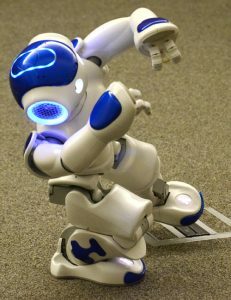 Rowdy the Robot dances for the school board. 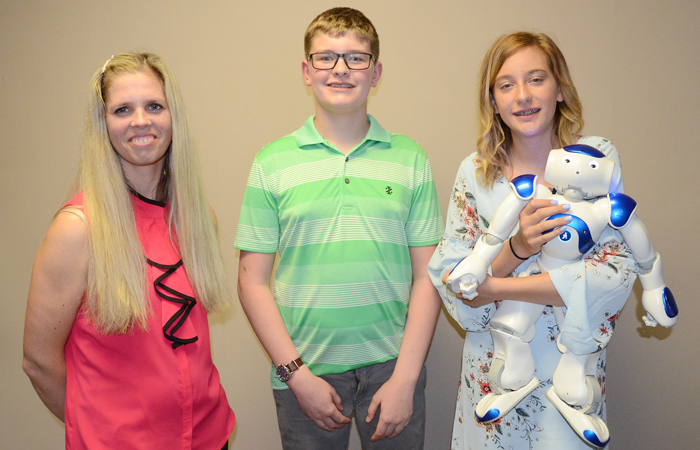 Richcreek introduced seventh graders Milana Whitaker and Owen Stevens, who programmed a robot named Rowdy to do such human-like tasks as kicking a soccer ball, practicing tai chi and riding a small horse. The two students, along with the hyper-verbal robot have been featured on television news and the horse-riding project has the students in consideration for a spot in the Guinness Book of World Records. The students told the board they enjoyed programming Rowdy but admitted it was a challenge at times. Stevens told the board that sometimes, programming provided challenges. He said he is currently torn between possible career fields. “I’m trying to decide whether to be a pilot or a programmer,” he said. The board was presented with updates on Lakeview Middle School students who will head to national competition as part of National History Day and watched a skit from Edgewood Middle School student historians who traveled to Maryland last year to compete. 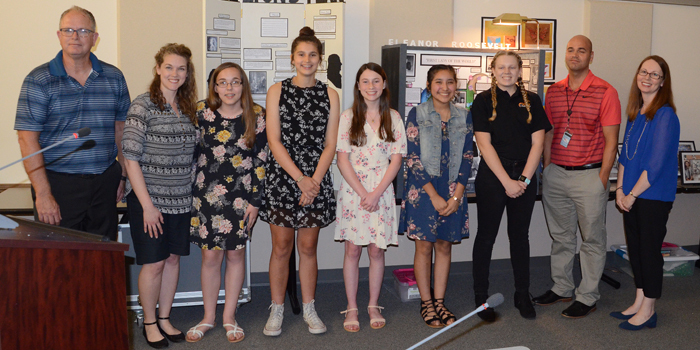 The Lakeview students, Abigail Rahn, Hannah Shapiro, Elena Sullivan, Kaylee Ochoa and Rachel Doyle created presentations on Alexander Hamilton and Eleanor Roosevelt, which were on display in the board room. The National History Day contest is scheduled for June 10-14 at the University of Maryland in College Park, Md. Representing Edgewood Middle School, Geoffrey Hochstetler, Jason Benyousky, Keller Bailey and Ryun Hoffert presented a reenactment surrounding Civil War veteran, noted writer and Warsaw native Ambrose Bierce. Following the presentation, the students told the board they had been doing reenactments for some time and have done skits on other historical events such as the battle of the Alamo and Pearl Harbor. Heard an updated from Warsaw Area Career Center Principal and Director Ronna Kawsky on her facility’s progress regarding the WACC Work Ethic Certificate and the additional of a child care program. Heard an update from Tracey Akers on the corporation’s Boomerang Backpack program. Heard and update from Chief Analytics Officer Shelly Wifong on 2018-19 registration. From left are Project Lead the Way teacher Abbi Richcreek, Owen Stevens and Milana Whitaker with Rowdy the Robot. 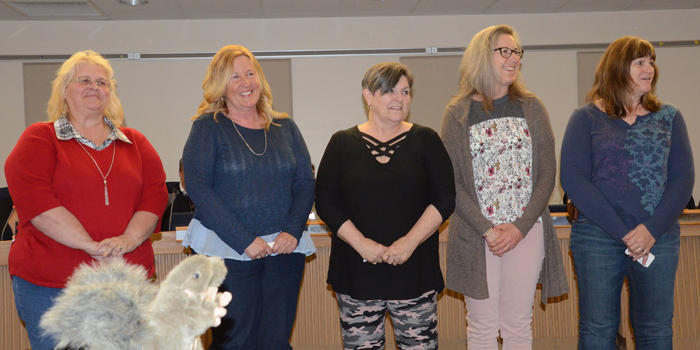 Longtime bus drivers recognized by the school board are, from left, Sally Johnson, 28 years; Lisa Wallen, 31 years; Colleen Fritcher, 25 years; Bernie Waikel, 26 years; and Jackie Clase, 30 years. 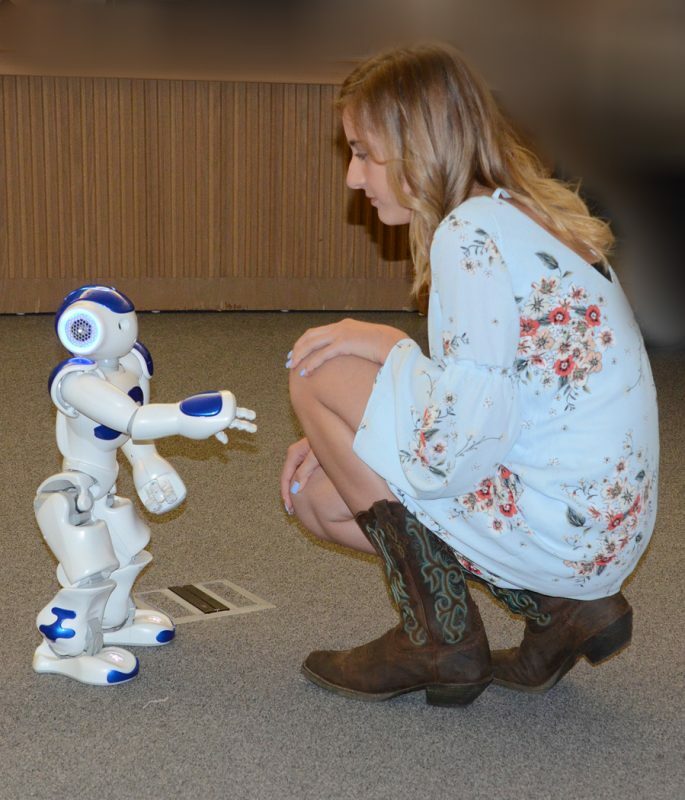 Edgewood Seventh Grader Milana Whitaker engages Rowdy the Robot. 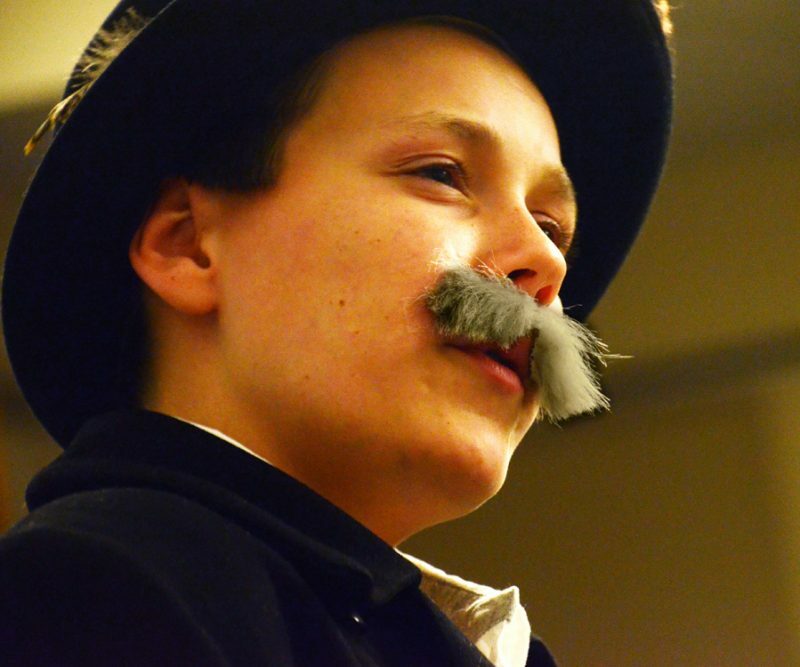 Jason Benyousky, 13, portrays Civil War veteran and writer Ambrose Bierce.